Walter is known as an antique automobile enthusiast as well as being the world's leading automobile literature dealer. 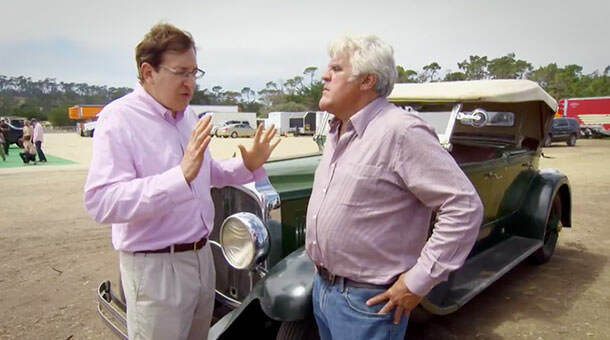 Here he is with Jay Leno and his 1928 Chrysler Imperial LeBaron. Test your knowledge of automobile history and the automotive industry. Our quizzes are just for fun but you can show off a bit too. Try your hand now! As many of you know, I have been buying and selling automobile literature as a fulltime business since the 1970’s. Unfortunately due to my recent health issues, we are going to have to discontinue all sales immediately on Ebay, Amazon and our website Autolit.com. Sorry but unfortunately there can be no exceptions to this and nothing can be sold as of March 20, 2019. You may still contact us by using our web site’s Contact Form. Responses will be made if possible. It is hoped that this closure is temporary and that I will regain my health. My doctor has advised that this is the best decision right now. Obviously my health and my obligations to my family are number one. Automobile literature has been my overwhelming passion for the majority of my life and I certainly do not take this decision lightly. Starting later in 2019, some of our massive inventory of literally millions of pieces of automobile and truck original literature will be auctioned by Automobiliaauctions.com located near Hartford, Connecticut. These fantastic auctions of automobilia have been run by my life long friend and automobile enthusiast Gerald Lettieri for decades. It is very disappointing for me to have to do this. We would like to warmly thank all of our customers for your past business and trust over many decades and thank you in advance for your understanding and kindness during a difficult time. AutoLit.com is the Internet home of Walter Miller’s Automobile Literature. We have been in business since 1976 and have been available through the Internet since 1996. Surrounded by filing cabinets and a never ending stream of new automobile literature and related materials, Walter and his staff are able to provide customers with an incredible selection from a huge and always changing inventory. AutoLit specializes in ORIGINAL automobile, truck and motorcycle literature! This means that literature purchased from AutoLit is the original item as printed by the manufacturer and not a photocopy or reproduction. Our customers range from serious collectors and enthusiasts to used car buyers. We invite you to browse through our website and our Online Store. If you have any questions or need additional information, please contact us!